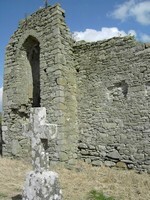 Gernonstown Church, situated in the valley of Gernonstown (originally Garlandstown, after the Norman family that had land here and in Co. Louth), measures 23m in length and 6.4m in width on the inside. Comprises a nave and chancel, with a barrel-vaulted chamber, pictured below right, perhaps the vestry, at one corner, still fairly intact, and the remains of a large tracery window, pictured left from outside the church, in the west wall behind where the altar was located. "Gernonstown Church is mediaeval in style and probably fell at the dissolution of the Catholic Church in 1539 under King Henry VIII. There is much evidence in the immediate area around the church of even earlier settlement. There are two ring-forts on higher ground above the church. These are pre-Christian homesteads. There is a tumulus (an ancient burial mound) in the adjoining field, giving further evidence of a continuance of habitation in this area over the ages."